We have a few Macallan fans in the club so news was not taken so well when we heard that The Macallan were moving away from age statements and reworking the regular lineup from the distillery. 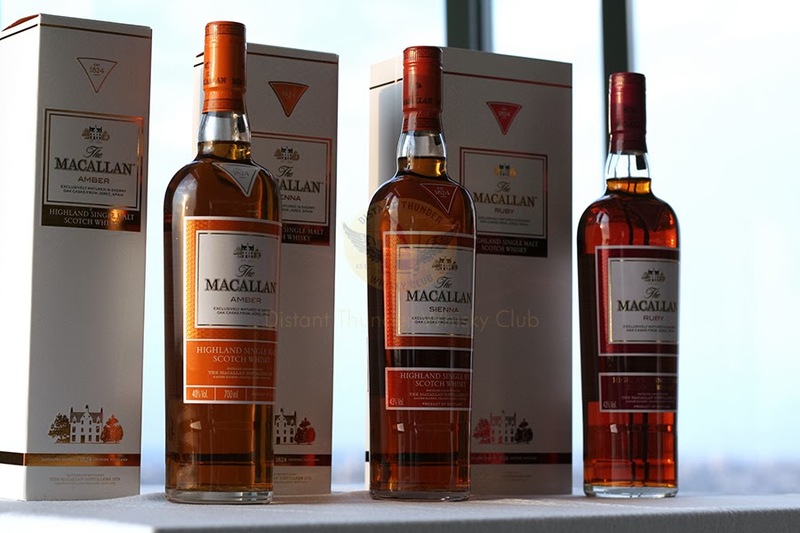 On the 28th October, 2013, I had the pleasure of attending the official 'unveiling' of the Macallan no age statement lineup titled The 1824 Series. As mentioned The Macallan is moving away from age statements which is a growing trend in the current whisky industry. 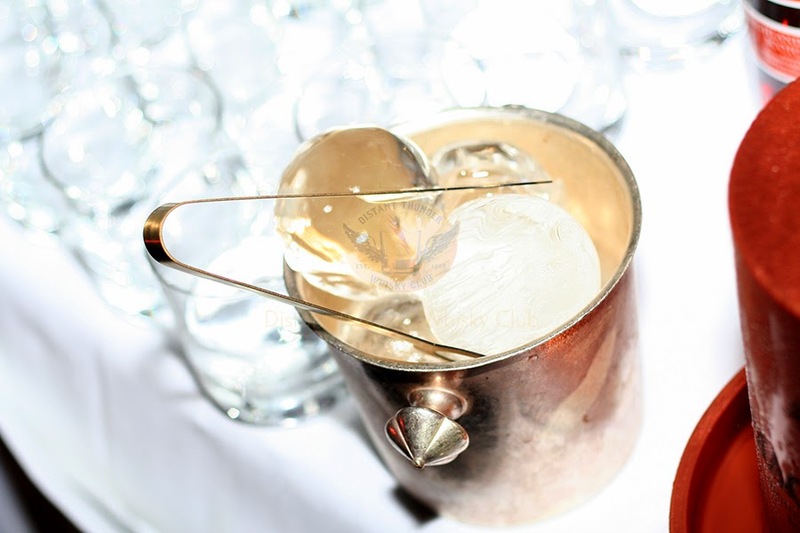 Various speculation on this trend tends to be that it is all about lack of stocks many distillers are encountering as this whisky bubble continues to expand world wide. What I have heard all too often within the industry (being the distillers PR engines) is that the importance and focus of age statements is not a justifiable reason for buying a whisky, where by it should be on quality not age. If your into your whisky then age is marker of certain expectations in maturity so truly I think there is no way of getting around the way people buy whisky. But this is growing trend so expect a lot more of it to come especially by the big producers. Refreshing cocktails were the order of the day to stem the radiating heat. Setting the scene The Macallan has always positioned itself apart as a premium product from the marketing, packaging, and of course price point. In tow it was no surprise the evening also reflected this from pedestal positioned whisky taking pride of place to, the event location being the Blu Bar located on level 36 of Shangri-la Hotel, Sydney. Even with the hot sun pounding through the floor to ceiling windows making feel like a cocktail party in a sauna, it was hard to miss the spectacular views into the Sydney Harbour. As the sun passed cocktails were indeed served to quench ones thirst. Though I do not know the name the cocktail it was based on the Amber expression muddled with Creme de Gingembren (a ginger flavoured creme liqueur), vanilla syrup, grapefruit bitters and lime juice. I was particularly taken by the freeze dried apple garnish and had to sample a few more just to ensure they were still just as tasty. The evening was quite full with a crowed of well to ladies an gents as well as some of the more regular faces amongst to be seen. A short but heavily sales weighted introduction by The Macallan Brand Ambassador started the evening off but I tired very quickly as it was reiterated over and over again how much money The Macallan were putting into whisky production, how much their sales were in recent years, and how premium their product was. I did feel like I was being sold into rather than welcomed. Following on the whiskies were walked through by SMWS Cellarmaster & NSW Manager Andrew Debridge in the all too professional manner we have become accustomed to. I found the presentation very informative and in-depth as we nosed and tasted our way into the evening. Though the noise level was at pitch in between tasting Andrew would spare a few minutes to answer any questions we may have had. 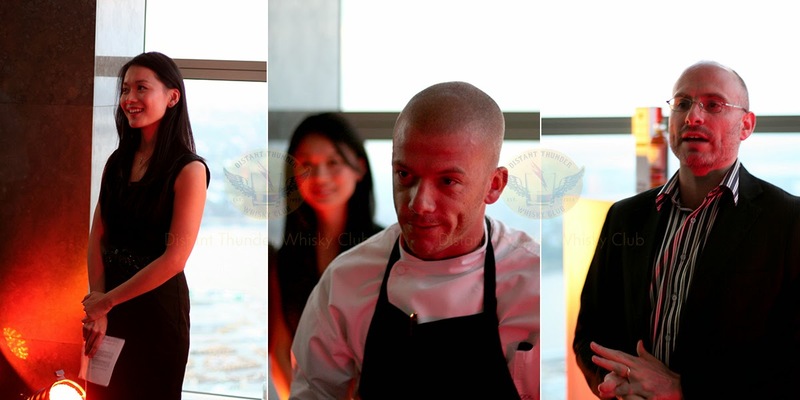 Head Chef Matthew McCool inadvertently kept the humour of the evening running simply by his method of public speaking. Almost whispering like a field mouse the head chef introduced each of the selections of Canapes before quickly ducking, diving and weaving into the crowd either to get back to the kitchen, or take the scrutiny of the crowd off himself, or maybe a bit of both. It is clear from the 3 whiskies unveiled that they are aptly named in reflection of colour being Amber, Sienna and Ruby. Noting at the time we did not see the 4th or 5th members of the family Gold, and M. The naming is well chosen with the colour of the whisky reflected well against it and as the sun was setting through the room the colours became even more alive. Just by the colour you can tell these are all 100% sherried oak whiskies. The Macallan have put special emphasis on quality oak selection to ensure colour, body and flavour are developed during maturation specifically for each expression. In tasting the whiskies I found the expressions all to underwhelming for the hype it has been given. Reflecting has The Macallan become the last horse out of the gate? Sherry, sherry, and even more sherry. I don't know about you but I am really starting to have to take a deep breath and simply sigh out when another distillery mentions a new release with a sherry oak finish. Ok so The Macallan is no stranger to this granted as specialist oaks is their thing and yes they taste just fine but it all is getting a little too much in my books. I really would have liked to have given some detailed tasting notes as I do not like writing about something without reference but I spilt whisky all over my notes on the night blurring everything. I was promised some samples weeks before the event that never arrived and then promised them twice more after the event but again they never arrived. Apparently the courier company "left them in a safe place" hhhhhhhmmmmmmmm. Sienna was my fav from what I recall as the Ruby just got too juicy but all of them were also faint or mildly transparent at the same time. No aggressive or offensive scents in the nose they sort of fall into the whisky when your not having a whisky moment. Too comfortably maybe or just too safe. Unfortunately it is near impossible to give any notes either on the paired food. Not for lack of trying to actually taste them my evening was completed by searching for the nearest burger joint as the alcohol welled inside me. It was clear most others felt the same as groans of dismay could be heard when single platters were consumed before ever entering the door. You could see the fear in the waitresses eyes at every turn. Yes and I know I have said it all too often but ample food and water is imperative at any of these events to ensure some level of focus. Funny and sad at the same time the Macallan Ice Ball Machine came out to serve with the whiskies after the presentation. Quoating from the official press release "This ingenious contraption uses the weight and ambient heat of its metal construction to melt large ice cubes into a perfect sphere… the spherical nature of the ice balls also served the practical purpose of slowing down the melting process, cooling at a rate that preserves the integrity of the single malt". Unfortunately the ice ball was too big for the Macallan Glasses so a quick change out to a wide neck generic glass was made. Oh my! At a whopping £650.00 you would have thought they matched the ball t the glasses. Grateful as I always am to even have the opportunity to attend events my final verdict is that those most familiar with The Macallan are going to feel a little disappointed with the end results of these whiskies, especially with the price points they have been allocated. These are not bad whiskies by any means and I do not doubt the time and science given to developing them, they just aren't out of the ordinary in anyway others have not achieved already. Sherry is becoming the new alcopop of whisky guaranteeing access to a wide and varied audience and not offending anyone. I look forward to what is coming next in The Macallan NAS (No Age Statement) world and hope it is not that other unique idea... port wood.